Poland has reaffirmed its call for African Heads of State and government to attend the Climate Change conference slated for the exotic city of Katowice in about five months town. Making the clarion call to Ambassadors from African countries, accredited to Poland, Minister of Foreign Affairs for Poland Mr Jacek Czapatowicz said the climate indaba or conference, otherwise known as COP24 will gain more traction if Presidents attended. This is according to statement issued by First Secretary Press and Public Relations Kellys Kaunda in Warsaw where Mr Mukwita is attending the meeting as none resident Ambassador to Poland along with 16 other Ambassadors. Ambassadors from Kenya and Namibia told the meeting held at the Polish Ministry of Foreign Affairs headquarters on Szucha street that President Uhuru Kenyatta and President Hage Geingob had already officially confirmed participation to the crucial conference. Zambia has already started receiving financial resources for mitigating the effects of Climate Change while President Edgar Lungu has personally escalated the planting of one million trees as part of fighting the adverse effects of Climate change. Ambassador Mukwita could not state for a fact whether President Lungu who has shown full commitment to fight the adverse effects of climate change would attend the high-level UN meeting along with counterparts such as President Geingob and President Kenyatta. “It would be great though if our President attended given the open show of determination to fight the adverse effects of climate change which he has ably demonstrated at Presidential level recently,” said Ambassador Mukwita. Every year, the Minister of Foreign Affairs holds high level meetings with Ambassadors accredited to Poland to discuss economic diplomacy and developmental issues. Ambassador Mukwita was attending the meeting for the first time since he presented his credentials to President Andrzej Duda in April. Zambia is currently discussing a $100 million government-to-government package to establish a tractor factory that will create 500 jobs, help reduce poverty and escalate agriculture production for Zambia through mechanised farming with URSUS, a Polish company that manufactures tractors and buses, among its many products. President Lungu stated in the 7th National Development Plan that the project was vital in his continued fight to reduce poverty and develop Zambia. 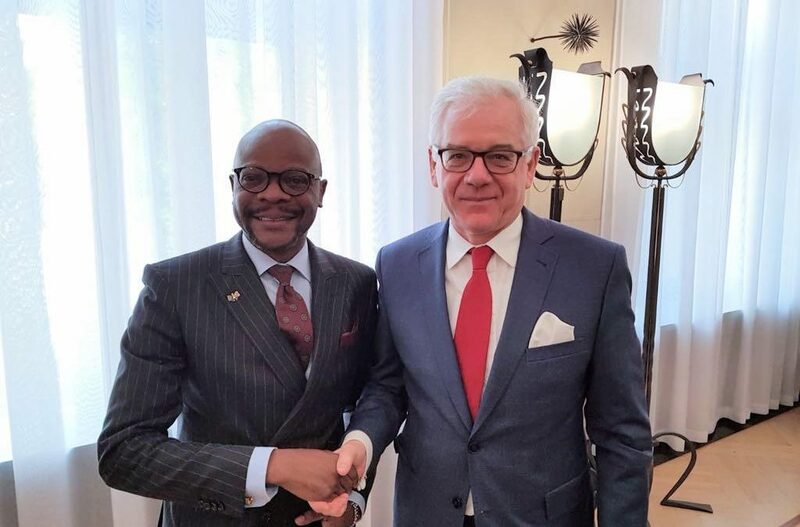 In May, Ambassador Mukwita re-ignited the discussion on the tractor plant project, which Minister of Foreign Affairs of Poland Mr Czapatowicz said is “active” on the desk of Finance currently. President Lungu is determined to fight poverty through agriculture and make Zambia the grain basket of the sub Saharan region given its advantageous position as land linked surrounded by eight countries. “The realisation of the tractor factory apart from creating 500 new direct jobs will mean a whole new set up of skills development and a future for the young through agriculture for us,” said Ambassador Mukwita.